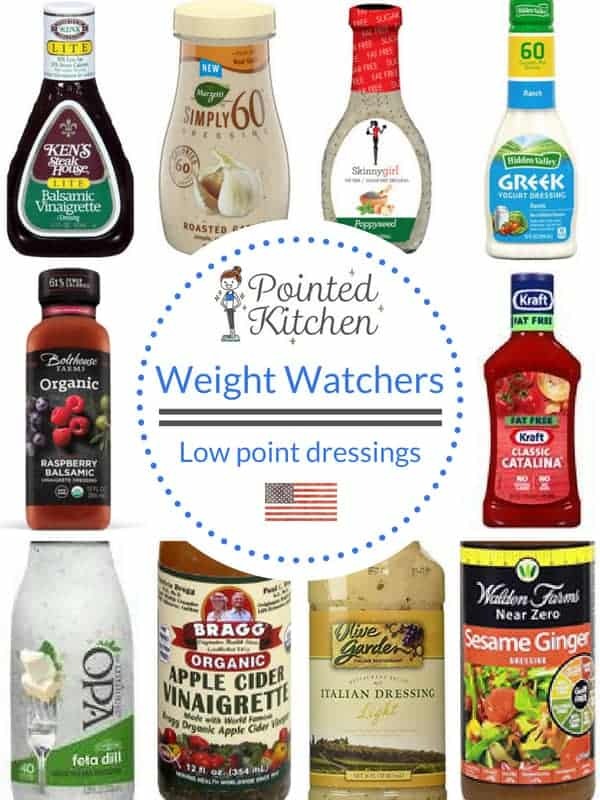 A question that comes up a lot in Weight Watcher forums and meetings, especially during the summer months, is what Low Point salad dressings are available. We are lucky as more and more low fat & low sugar dressings are becoming available and many taste very similar to the high fat, high sugar ones which are so high in points. I’ve looked at some of the most popular salad dressing and have pointed them per 2 tablespoons for you below. This Balsamic Vinaigrette is 2 SmartPoints per 2 tablespoons. It is gluten free and has 33% less calories and 50% less fat than regular dressings. It is available from most major grocery stores and also from the Ken’s Steak House Store on Amazon here. 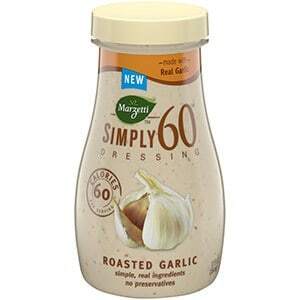 Marzetti’s Simply 60 Roasted Garlic dressing is 2 SmartPoints per 2 tablespoons. It is made with real garlic and buttermilk and does not contain any preservatives. It is available at most big grocery stores. Now, Skinnygirl has been a revelation. 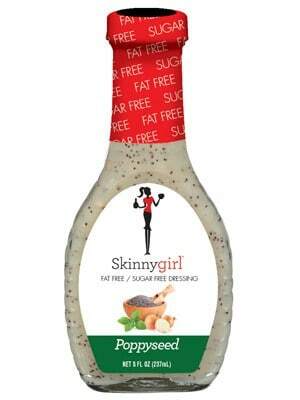 This poppyseed dressing is fat free and sugar free and is 0 SmartPoints per 2 tablespoons. This one is particularly good with a kick of lemon and is packed full of poppyseeds. 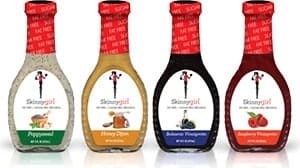 The Skinnygirl range of dressings (Balsamic Vinaigrette, Honey Dijon, Poppyseed and Raspberry Vinaigrette) are all 0 SmartPoints per 2 tablespoons. They are widely available in the USA or you can get them as a variety pack from Amazon here. The Hidden Valley Greek Yogurt range of dressings are all 2 SmartPoints per serving and come in Spinach & Feta, Lemon Garlic, Ranch and Cucumber Dill flavours. They are available at most big grocery stores and can also be brought from the Hidden Valley Store on Amazon here. 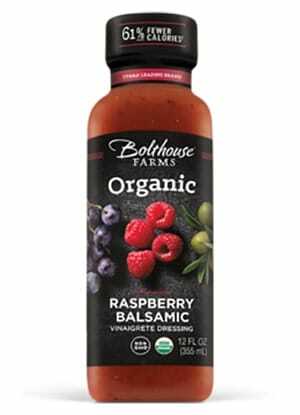 This Raspberry Balsamic dressing is just 1 SmartPoint per 2 tablespoons. It contains no artificial preservative or artificial flavors, is dairy free and organic. 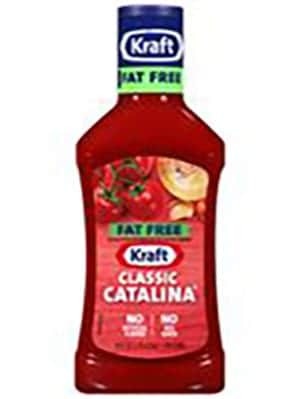 This Kraft Fat Free Classic Catalina dressing is just 2 SmartPoints per 2 tablespoons. It has a sweet, tomato flavour with a bit of spice. It can also be used as a relish for burgers and is available at most large grocery stores. This lovely feta dill Greek yogurt dressing is just 2 SmartPoints per 2 tablespoons. 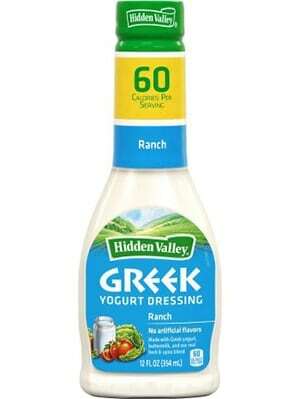 If you like Greek Tzatziki you will love this dressing. 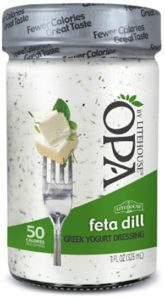 OPA do a range of Greek yogurt dressings. The Strawberry Poppyseed and the Avocado Cilantro dressings are both 2 SmartPoints per tablespoon whilst the Tzatziki Ranch is just 1 SmartPoint per 2 tablespoons. This fat free Apple Cider Vinaigrette is just 1 SmartPoint per 2 tablespoons. The dressing is certified organic and is available at a number of stores across the US and is also available to buy online. 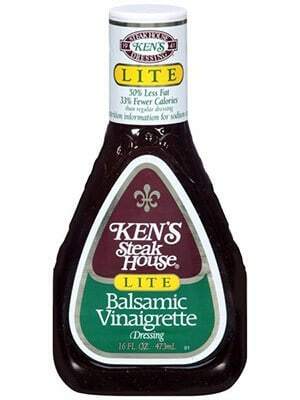 This lovely light Italian dressing by Olive Garden is just 1 SmartPoint per 2 tablespoons. If eating salad with an Weight Watchers friendly pizza this dressing is a must! It is best eaten cold. It is available at most big grocery stores but is also available from Olive Garden’s Amazon store here. Loved it. Thank you so much. I will share it. Thanks for the recommendations. I never knew Olive Garden Italian was so low in Smart Points. Yes the Olive Garden Italian Light is just 1 SP for 2 tbsp. A bargain I think! Thank you for your comment. This is amazing and so very helpful.